BOLSOVER is a large parish, and contains the townships of Bolsover and Glapwell, which together, comprise 5441A. 3R. 4P. of land, mostly a strong clay, with some limestone soil, abounding in coal and ironstone, and in 1851 had 378 houses and 1611 inhabitants, of whom 846 were males and 765 females; rateable value £5328 0s. 5d. BOLSOVER is a large village, township, and decayed market town, situated on one of the highest points in the county, 6 miles, E. from Chesterfield, 24 miles N.N.E. from Derby, 8 miles N.W. from Mansfield, and 145½ N. by W. from London. It contains 4702A. 1R. 5P. of land, and in 1851 had 357 houses and 1512 inhabitants, of whom 792 were males and 720 females; rateable value £4665 6s. 3d. The Duke of Portland is principal owner and lord of the manor, which is copyhold; and a court is held every three weeks at the Swan Inn. Thos. Walkden, Esq., steward. Earl Bathurst, the Duke of Devonshire, and others are also owners. The Church, (St. Mary) a vicarage, valued in the King’s book £5 19s. 4d., now £111., has been augmented with £200 benefactions, £400 Queen Anne’s bounty, and £200 parliamentary grant. The Duke of Portland is patron and impropriator. Rev. John Hamilton Gray, M.A., Rural Dean, incumbent. The Church is a large structure, partly in the Norman style, intermixed with the early English, with a tower surmounted with a short spire. It was given by Wm. Peverel to Darley Abbey, and confirmed by Wm. de Ferrars, Earl of Derby; it was afterwards appropriated to that monastry. The Earl of Oxford gave £10 per annum as an augmentation of the vicarage, in 1716. Attached to the south aisle is a mortuary chapel belonging to the Cavendish family, and contans two monuments to the members of that family, one of which, in the Gothic style, is to the memory of Sir Charles Cavendish, who died in 1617, and has his effigy in armour, recumbent on a mat, under an enriched arch, supported by Corinthian columns. Underneath is a recumbent figure of his lady, the heiress of Cuthbert Lord Ogle, and beneath her are the effigies of their children in kneeling postures. The costly marble monument of Henry Duke of Newcastle, who died in 1691, has a marble sarcophagus supported on each side by Corinthian columns; it commemorates also Frances, Duchess of Newcastle, who died in 1695; Margaret, their daughter, wife of John Holles, Duke of Newcastle, who died 1716; Sir Charles Cavendish, brother of the first Duke of Newcastle; and Charles Viscount Mansfield, the Duke’s eldest son, who died in his lifetime. In April, 1854, the vault under these remarkable monuments was opened to receive the remains of the late Duke of Portland, he makes the fourteenth inhabitant of this family mausoleum. The others are, first, Sir Charles Cavendish, died 1617; second Catherine, Baroness Ogle, his wife; third, Sir Charles Cavendish, their second son, died 1658; fourth, Charles Cavendish, Viscount Mansfield, eldest son of the Marquis of Newcastle, died 1659; fifth, Henry Cavendish, second Duke of Newcastle, died 1691, sixth, Frances Pierrepont, his Duchess, died 1695; seventh, Margaret Cavendish, their daughter and heiress, wife of William Hollis, Duke of Newcastle, she died in 1718, and her funeral was the last occasion on which this vault was opened, until the interment of the late Duke of Portland, who was her great, great, grandson and heir. The six other bodies contained within the vault are those of infants of various generations of the family. In the chancel is the tomb of Huntington Smithson, architect, who died in 1648; with other memorials to the Woolhouse family, and Barkers of Norton Lees Hall, Lady Barker, relic of the late Sir Robert Barker, Bart., the last of this family, and heiress of Brabazon Hallowes, Esq. was buried at Bolsover, in 1806. The most ancient and remark­able object in the Church is a carved stone over the chancel door, representing the Crucifixion; it was pronounced by the Archeological Association, on their visit to Bolsover, in 1851, to be Saxon, “pre-Norman.” In the Church is an ancient sculptured stone, placed within the rails of the communion table; it is five feet long by three feet wide, and was discovered in the early part of the last century, previous to which it had been a step to the north door of the Church. On the under side of this stone is a rude sculpture in high relief, representing the nativity of our Saviour. The Virgin Mary appears to be sitting in a stable, with a multilated figure of the infant Jesus in her lap, who seems to have had one hand on a dove, three figures standing round the Virgin mother are most-likely the wise men of the east, who fell down and worshiped the infant Jesus, and opening their treasures presented him with gifts, gold, frankincense, and myrrh. Two camels’ heads are looking over into the manger, and the great projection of them seems very singular; the style of the drapery and other parts of the sculpture seem to attribute it to the 12th or 13th century, and it then was most likely an altar piece and held in high estimation. From the situation in which it was found, it probably was put there as a place of safety, during some of the frequent attacks which were made on Bolsover Castle. The vicarage is a small house near the Church. There was a market at Bolsover as early as the year 1225, which was discontinued about the middle of the last century; but fairs are held on the last Friday in April and first Friday in October, for cattle and cheese, and a statues for servants is held on the first of October. The Wesleyan Methodists and Independents have each chapels here. In 1855 a National school for boys and girls was erected here in the Gothic style of architecture; it is a neat stone building, with a master’s house attached. The parish was enclosed under an act passed 1777, and the award signed in 1780. Feast second Sunday in August. The manor Belesover, which belonged to Leurie, was at the Domesday survey, held by Robert under William Peverel. It is probable that Peveril afterwards held it in demesne, and built a castle; for long after the forfeiture of this estate by Wm. Peveril the younger, for poisoning Ralph, Earl of Chester, in 1153, Bolsover castle is mentioned as being given with the manor by Richard I. in 1189, to his brother John, on his marriage with one of the Earl of Glocester’s co-heiresses. On the agreement entered into between Longchamp, the Bishop of Ely, and John, the king’s brother, then Earl of Morteyne, during Richard’s absence in the Holy Land, Bolsover Castle was committed to the custody of Richard del Pec. Two years after John’s accession, Geoffrey Luttrel was appointed one of the overseers of the expenditure of £30, for enclosing Bolsover Park for the King. In 1204, the government of this castle was given to William Briuere; Bryan de Lisle was appointed governor in 1207; Nicholas de Chevat in 1208. In the year 1215, it was in the possession of the rebellious barons, when William Ferrars, Earl of Derby, having raised troops for the king, took it by assault, and in recompense was appointed governor. The same year Byran de Lisle was reinstated in his government, and in 1216 received a mandate to fortify the castle against the rebellious barons, or if he found it not tenable to demolish it. The same year the King appointed Gerard de Furnival to reside in Bolsover castle, with his wife and family, for the better preservation of the peace of those parts. William Ferrers, Earl of Derby, was again appointed governor by King Henry III., soon after his accession (in October, 1216), and held the government for six years. During the twelve following years there was a quick succession of governors. In or about the year 1234, the manor and castle of Bolsover were granted to John Scot, Earl of Chester, who, dying without issue, it passed to Ada, his fourth sister and co-heiress who married Henry de Hastings, Lord of Bergavenny, having been assigned as part of her portion in 1236. Other lands having been given in exchange to Hastings, 1243, Bols­over reverted to the crown and was not afterwards in possession of a subject till 1514. Roger de Lovetot was made governor in 1253. Ralph Pipard was appointed governor of Bolsover and Hareston castle for life, in 1301; he died in 1308. Sir Richard Surry died seized of the castle and manor in 1395; Edmund of Hadbam, Earl of Richmond, father of King Henry VII. died seized of it in 1456. King Henry VIII. in 1514, granted Bolsover and Hareston castles to Thomas Howard, Duke of Norfolk, in reward for his service in the expedltion against France, to be held by the service of one knight’s fee, but on the attainder of his son, the second Duke, in the 38th year of the same monarch, they reverted to the crown. King Edward VI. in 1552, granted a lease of the manor of Bolsover to Sir John Byron, for fifty years, and the next year granted the fee to George Talbot, Earl of Shrewsbury, in whose family it continued till 1613, when Gilbert, Earl of Shrewsbury sold the the manor of Bolsover to Sir Charles Cavendish. Henry, second Duke of Newcastle, grandson of Sir Charles, dying without issue, the estate became the property of Margaret, his sister, who had married John Hollis, Earl of Clare, afterwards Duke of Newcastle, their daughter married Harley, Earl of Oxford, from whom by a daughter also, Bolsover was conveyed to the Bentincks, Dukes of Portland, in whose possession it still continues. Long before this the old castle had been in ruins, for we find in the time of Leland (about 1550) this ancient fortress was fast decaying. It was purchased by Sir Charles Cavendish, when it was in ruins and now not a vestige of it remains. The present mansion was rebuilt from the foundations of the old one, by Elizabeth, Countess of Shrewsbury, whose passion for castle building is well known, and was completed by her son, Sir Charles Cavendish, in 1613, after which it was transferred to him by the Shrewshury family. Thc new castle was built exactly on the foundation of the Norman keep, which can be distinctly traced, and the character of a Norman castle was preserved throughout, so that it is a remarkable specimen of the Elizabethan restoration of an ancient Norman castle of the times immediately succeeding the conquest. On the breaking out of the Civil wars, the Duke, owing to his attachment to the royal cause, was obliged to leave the country and reside at Antwerp till the restoration. The Earl of Newcastle being commander in chief of the King’s forces for the northern and midland counties, placed a garrison at Bolsover, of which he made Colonel Muschamp govenor. The Earl was at Bolsover with his staff in the month of December, 1643. About the middle of August, 1644, Bolsover Castle was taken by Major-General Crawford. The Parliamentary writers represent it as having been well manned and fortified with great guns and strong works. It is said to have surrendered on summons, and that 120 muskets were taken in it, with much plunder. When the Marquis’s estates, which had been seized by the parliament, were about to be sold, his friends in England made great efforts to save Bolsover and Welbeck, but in vain. Bolsovor was purchased on speculation, with the intention of pulling down the castle and selling the materials. After part of it had been pulled down, Sir Charles Cavendish re-purchased it at a great disadvantage for his brother. The family portraits, by Vandyke, were preserved, and Lord Mansfield, after the death of his uncle, had Bolsover Castle some time in possession, but was unable to repair it. When the King’s affair’s had grown desperate, the Marquis of Newcastle retired to the continent, and resided chiefly at Antwerp, till the restoration, after which he returned to England, and in 1665 was created a Duke, as before mentioned. About this period, he retired front public life, spending his time chiefly in the country, “pleasing himself,’ as the Duchess in the life of her husband expresses herself, “in the manage­ment of some few horses, and exercising himself with the use of the sword, which two acts he had brought to an absolute perfection. During his residence at Antwerp, he pub­lished his celebrated work on horsemanship. A second edition was published in England, in 1667. After the Duke had a little recovered from the wreck which had been made of his fortune, he repaired Bolsover Castle, and occasionally resided there during the latter part of his life. Both the Duke and Duchess of Newcastle found great resources in literary pur­suits; they were both dramatic writers and poets. The Duchess’s printed works, which were chiefly philosophical, filled ten folio volumes, and she also left three more in manu­script. Her printed works are become rare, and few of them would afford amusement to readers of the present day, except her Life of the Duke. The Duchess died in 1673, the Duke in 1676 ; they were buried in Westminster Abbey, where a magnificent monument was erected to their memory. Henry, the second Duke of Newcastle, who resided often at Bolsover, died there in 1691, and was buried in the parish church. Leaving no son, his estates devolved to his daughter and co-heiress Margaret, married to John Holles, Earl of Clare, who, in 1694, was created Duke of Newcastle. Henrietta, their only daughter and heiress, married Edward Harley, Earl of Oxford. Lady Margaret Cavendish Harley, heiress of the Earl of Oxford, brought the manor, or as it is called in some records, the barony, of Bolsover, to William, Duke of Portland, great grandfather of the present noble owner, William John Cavendish Bentinck, Duke of Portland. The barony of Bolsover and Woodthorpe was valued in 1641, at £846 8s. 11d, per annum. Bolsover Castle stands on the abrupt brow of a steep hill, and commands some beau­tiful and extensive prospects, while it is a most picturesque object to the inhabitants of the surrunding country. It consists of two detached buildings, one of these, the Castle, is the restoration of the ancient Norman fortress. It is a square mansion, with turrets and a high tower at the north-east corner. All the rooms in the basement and first stories, are arched and supported on pillars. The Norman character is perceived in these pillars and arches, and some antiquarians believe that the tower portions of the pillars in the basement storey are original, and as old as the time of King Henry I. The kitchen, larder, and servants’ hall are noble and lofty rooms. In the first story, the pillars next on the spot immediately above the pillars in the basement, are of a similar height, but of a more ornamented character. The arched roof of the drawing room, or pillar room, is elaborately and beautifully carved. The pillars in the centre are both elegant and massive, the wains­coting is walnut, richly carved and gilt, and the furniture of the room is made to suit the Elizabethan period; there is here a very beautiful statue (life size) of the only daughter of the Rev. John Hamilton Gray, in marble, executed in Rome. An ante-room, furnished with engravings and marble busts, conducts to the drawing room, which also is supported on pillars, and, adorned with a profusion of beautifully carved oak cabinets, and gilded wainscot, from Venice. The dining room communicates with the entrance hall, which is also furnished with fine carved oak cabinets. The dancing and drawing rooms are about twenty-five feet square. The only large room in the house, is the Star chamber, on the second story, which is upwards of forty feet long, and has been fitted up as a library and museum; the former of which contains a very considerable collection of books, &c., but what possesses the most attraction, is the rare and valuable assemblage of Etrurican vases, which the Rev. Jno. Hamilton Gray collected, in Italy, and which is considered to be one of the finest private collections in England; besides the collection of the Etrurican vases, there are also a number of interesting relies of the royal family of Stewart. The Norman Castle has always been kept in good repair, and during the last twenty-six years, that it has been inhabited by the Rev. John Hamilton Gray, M.A., (the vicar), it has been fitted up in the style of the seventeenth century, so that a stranger unacquainted with the story of the place, might imagine the quaint old carvings and curious cabinets, and chests, to have been actually the property of the famous “Bess of Hardwick,” instead of having been collected during the last quarter of a century. There have been various opinions concerning the date of the magnificent range of buildings which extend along the grand terrace, now unroofed and in a dilapidated state. Mr. Bray was of opinion that the apartments in it were fitted up for the royal visists before mentioned. Dr. Pegge supposes it to have been erected some time after the Restoration. Lord Orford was of the same opinion. 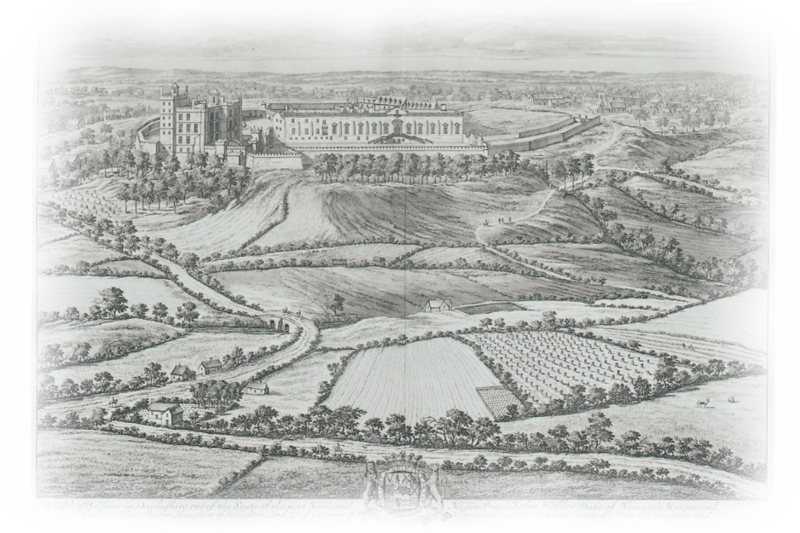 The date of Diepenbeck’s view of Bolsover (1652), decides the point, that the building was erected before the Restoration; it is equally certain that it must have been erected before the civil wars, indeed before the royal visit before mentioned, it being impracticable that the King and Queen, with their court, and “all the gentry of the county,” could have been entertained in the mansion already described. From the slight manner in which the Duchess, in the life of her husband, speaks of the additions made by him to Bolsover Castle, it is a more probable conjecture that the great range of building, now in ruins, was built, as well as the mansion, which is now habitable, by his father. The Duke’s additions probably consisted of thc spacious riding-house, for the practice of his favourite amusement, the smithy, &c. Dating the sequestration of the estates of its noble owner, Bolsover Castle suffered much, both as to its buildings and furniture, but these damages were repaired by the Duke after the Res­toration. It is certain that the state apartments were not dismantled till after the year 1710, at which time Bassano speaks of them as furnished, and describes the pictures then in the several rooms, which are said to have been removed to Welbeck. The portraits of this Duke of Newcastle. on horseback, described by Bassano, are not now to be found there; probably they were in a state of decay. In the saloon at Welbeck is a very fine whole-­length portrait of the Duke, by Vandyke; there is a whole-length of the Duchess of New­castle, in one of the passages, in a fancy dress, by Diepenbeck. The gallery at Bolsover was about 220 feet in length by 22 it width; the dining room, 78 feet by 32; the two drawing rooms, one 39 feet, the other 36 feet by 33. (The article above has been punctuated to allow easier reading. Neil). Bolsover Park, which was enclosed in the year 1200, has long ago been converted into tillage. A few years ago, when the venerable proprietor of this Castle, the late Duke of Portland, attended his 81st birth-day, a festival was held within the walls of this magni­ficent ruin, and on the broad terrace below, when no less than three thousand persons assembled to do him honour, on a spot which commands one of the finest views in England, and amid scenes, rich in some of the most stirring incidents in English history. In the distance the mountains of the Peak, the beautiful undulations of Scarsdale, the rich scenery of Sutton Park, the noble woods and mansion of Hardwick,—below the vale of Sutton, and above the battlements and turrets of the ancient Bolsover Keep, formed a picture of uncommon beauty. The terrace and tilt-yard, were thronged with groups in their gayest holiday attire, music and shouts resounded in the walls, and old Bolsover never saw such a stirring scene since the days of King Charles the First, and the loyal Marquis of Newcastle. BOLSOVER was formerly noted for its manufacture of steel spurs and buckles, which were so admirably tempered, that it used to be said, a loaded waggon might pass over them without injuring them, and every ploughman and waggoner wore them. Tobacco pipes also formerly were extensively manufactured here, excellent clay being found in the neighbour­hood. Both these sourses of employment are now extinct, and besides agriculture, part of the inhabitants are employed in the collieries and iron works in the neigh­bourhood. Hockley, a district, which forms the N.W. part of the village. Oxcroft, a small hamlet and manor, 2 miles N. from Bolsover. The Duke of Newcastle is lord of this manor, and owner of 458A. of land. Shuttlewood, a hamlet, 2 miles N.N.W. Here are the remains of a bath, of which the water is strongly sulphurous, similar to that of Harrogate. Stanfree, a small hamlet, 2 miles N.N.W. Whaley, a hamlet and small village, 3 miles N.E. ; through which formerly a stage waggon went from this place to London, Woodhouse, a small hamlet and village, one mile N.N.W. from Bolsover. GLAPWELL., a small village and township, on the Chesterfield and Nottingham road, 5 miles N.W. fr. Mansfield, 3 m. S. fr. Bolsover, and 7 S.E. from Chesterfield, contains 739A. 1R. 39P. of land, including woods, &c., and in 1851, had 21 houses, and 99 inhabitants, of whom 54 were males and 45 females; rateable value, £662 14s. 2d. Thos. Hallowes, Esq., is the sole owner, and resides at the Hall, an ancient mansion, on a bold elevation near the village. The manor (Glapewelle), at the Domesday survey, was held with Bolsover; during the thirteenth century it was in the family of De Glapwell, whose heiress, it is probable, brought it to the Woolhouses. Wm. Woolhouse, Esq. died, seized of it, in 1411. The heiress of Woolhouse, about the middle of the 17th century, married the the ancestor of the present proprietor. There was formerly a Chapel at Glapwell. About the year 1260, an agreement was entered into between the Abbot of Darley and his parishioners of the ville of Glapwell, about roofing the Chapel; they agreed to give five acres of land for the purpose of repairing, or, if necessary, of rebuilding of it. There was many years a Presbyterian congregation here. William Woolhouse, Esq., who died, in 1667, gave a rent charge of £20 per annum to the minister. The Feast on November 12th. Richard Youle, in 1699, gave 20s. for a distribution of bread on Christmas day. Wm. Wilkson left 6s. 8d. a year to poor widows; and Francis Tompkin 10s. annually to the poor, which are distributed at Christmas. The poor have also 10s. a year from the bequest of Richard Johnson, (who also left 10s. yearly to the poor of Clown), and the interest of £10 from the bequest of Ann Stones. Samuel Dowker, in 1738, left the interest of £10 for a distribution of bread. Francis Leach is supposed to have left the annual sum of 3s. 6d., which is paid out of a farm. Isabella Smithson, 1795, gave the sum of £2,000 to be disposed of as her niece, Ann Morton, should judge most proper for the benefit of the poor. The above sum, by a suit in chancery, with the interest due to August, 1774, was recovered and laid out in the purchase of £3,308 4s. 3d. three per cent. annuities, by a scheme approved of and confirmed by the Master of the Rolls; it was directed that £20 or £25 should be paid to four women in any year as marriage portions, provided they had resided four years in the parish of Bolsover at the time of their marriage, and the person with whom they should intermarry had resided there the same period. The remainder of the divideads, deducting £6 for the vicar for his trouble, was to be distributed to poor persons. No marriage portions have been paid, though some applications have been made, but regarded as not being qualified. The divideds, amounting to £99 5s., are annually distributed on Christmas day and on Easter Tuesday, among poor persons of Bolsover. Rev. Francis Gisborne’s charity. (See Bradley. )—The sum of £5 10s. received by the vicar, is laid out in woollen cloth and blankets, and given to the poor. Those marked 1 are at Oxcroft, 2, Shuttlewood, 3 Stanfree, 4 Whaley, 5 Woodhouse, and the rest at Bolsover. Post Office, at A. Shacklock’s. Letters arrive from Chesterfield, at 9.0 a.m., and are despatched at 4.0 p.m.
Mansfield; Jph. Mellors and Thos Wall, Thurs.